This past weekend my husband and I saw the movie, “Inferno,” based on the book written by Dan Brown. The story follows famous symbologist Robert Langdon (Tom Hanks) as he investigates a trail of clues tied to Dante, the great medieval poet, through several beautiful European cities including Florence, Italy. I really enjoyed the movie, but even more than that, I loved seeing the scenes of Florence! It’s been too long since our last visit and now I have an itch to return. If you’re planning a Mediterranean cruise with a stop in Livorno, (the port for Florence), here’s some places to add to your day's itinerary! 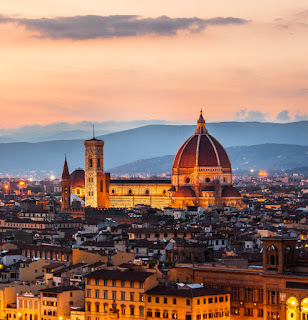 Florence's cathedral, Santa Maria del Fiore (often called the Duomo), is a vast Gothic structure standing tall over the city with its magnificent Renaissance dome. Entrance into the cathedral is free and for this reason there’s usually a long line to get in. Don't worry, the line moves pretty quickly. It’s definitely worth climbing the 463 steps (there is no elevator) to the dome for the view of the city as well as Giorgio Vasari's frescoes of The Last Judgment. The Duomo complex also includes the impressive structures of the Baptistery and Giotto’s bell tower. You may also climb to the top of the bell tower. 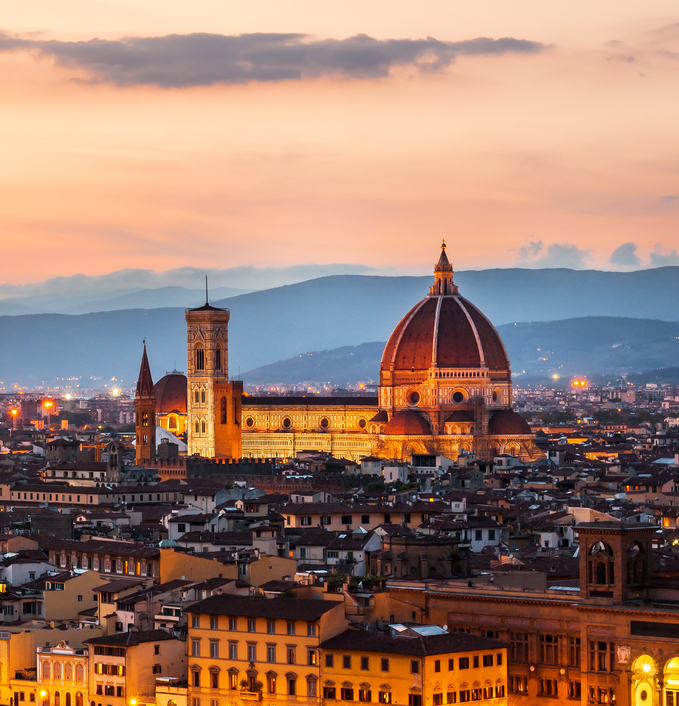 One of the world's top art museums, the Uffizi Gallery houses some of the most important works of the Renaissance, including works by Leonardo da Vinci, Giotto, Botticelli and Michelangelo. Size wise, it’s not a huge museum and you can get a pretty thorough look in about 2-3 hours. Wait lines outside Florence’s Uffizi Gallery are long, and can sometimes exceed two hours. You’ll want to purchase a skip-the-line ticket before leaving home so you head straight inside without wasting time. 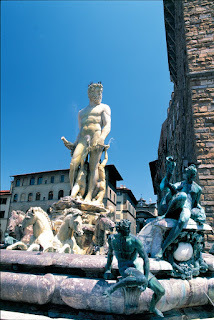 While I’m talking about art masterpieces, nobody should visit Florence without saying hello to David…that’s Michelangelo’s David! Did you know that Michelangelo created the 17-foot tall David from a single piece of marble? There are several copies of the statue in the city, one being in Piazza della Signoria in the exact spot where the original used to be. But to see “the" David you need to visit the Academia Gallery. Skip-the-line tickets as well as tickets for small group tours are available online. 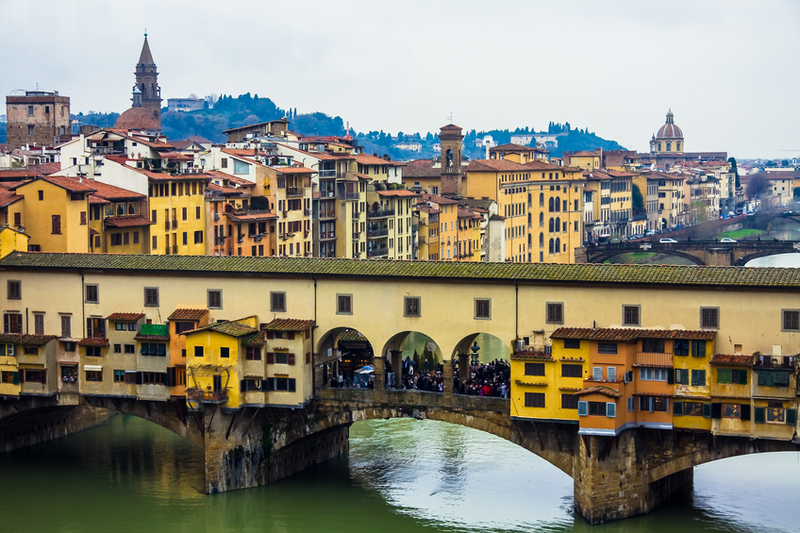 If you prefer to wear art, head to the Ponte Vecchio Bridge, one of Florence’s most illustrious landmarks. 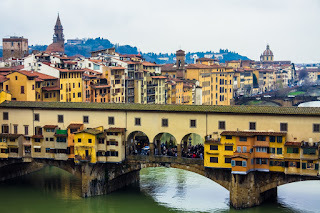 The Ponte Vecchio is the oldest bridge in Florence. Its current appearance dates back to 1345 when it was built to replace a bridge that was destroyed by a flood. Houses were built on the bridge, initially used as workshops and a diverse array of shopkeepers such as butchers and tanners. Today the houses are mostly jewelry shops ranging from affordable to pricey antiques. The Boboli Gardens is a lovely place to spend an afternoon in Florence, especially after your many busy stops on a Mediterranean cruise. You can take a leisurely stroll, enjoy a picnic lunch, or a let the kids expend some energy by running around for a bit. The Medici family created the gardens, home to a large number of statues and fountains, in the 16th century. The gardens played quite an important role in the movie Inferno, as Robert Langdon escapes the bad guys by running through their pathways!